Mainline CCTV Pipeline Inspection Cameras & Transporters. We stock such a wide range of cameras and camera tractor units that to give details of each model at this website would fill pages. We have therefore selected our most popular and recommended pipeline inspection camera as an example of what can be supplied - please ask for details of other products for specific requirements. The OZII & OZIII Cameras with Laser Diodes combine the latest laser beam technology with an advanced digital video caliper for measuring pipe joints, cracks, defects, debris and other abnormalities within the pipeline without the need to enter the pipeline! The cameras include special LED lightheads that incorporate dual laser diode projectors. The two laser beams are factory-aligned to a known separation distance regardless of the distance of the object to be measured or the cameras zoom position. The OZII & OZIII Cameras with Laser Diodes are specifically designed to eliminate spherical distortion, pin cushioning, or barrel distortion thats found in other pipeline inspection cameras. We can supply a range of camera transporters to suit almost every pipe diameter and environment. Shown below are just two of the highly adaptable models we currently supply. 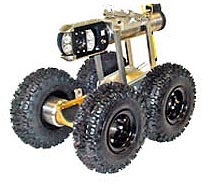 The Ultra Shorty variable-weight, tracked crawler is designed for inspecting pipelines from 6(150mm) - 30 (750mm) in diameter and is able to inspect 6" clay pipe with major offsets, meandering conditions, and protruding laterals. Dual 18" (450mm) cleated track drive provides 50% more wall contact area than wheeled crawlers. This greater contact area assures maximum traction under all inspection conditions. The Ultra Shorty 21 offers the same quality and proven performance as the Ultra Shorty transporter but also provides a reduced length measuring only 21" (525mm). This transporter can inspect 6" (150mm) to 36" (900) lines with major offsets and protruding laterals. A lift is available to optically center the camera in 30" (750mm) to 36" (900mm) lines. Three standard wheel sizes and optional manual or electric camera lifts are available to maximise performance. Optional high traction tyresare available for extreme slippery conditions. Pipe Ranger inspects 7" (175mm) relined pipe through 60" (1500mm) diameter pipe. Its unique two (2) speed transmission doubles the torque of the unit to produce maximum pulling power in large diameter pipe when the 10.5" (262mm) diameter tyres are installed. When assembled with a pan-and-tilt camera, the reduced length of the transporter / camera assembly can negotiate most difficult entry conditions and standard sweeps. The Steerable Pipe Ranger offers all the same features of the Pipe Ranger but includes full proportional steering that enables you to traverse meandering pipe and 45° and 90° turns. One joystick is used to control steering, the optional remotely controlled camera lift and a pan and tilt zoom camera. The remote controlled camera lift precludes manhole entry during insertion and retrieval. The Steerable Pipe Ranger combined with the OZ II optical zoom camera offers you one of the most compact assemblies in the industry.